Alive still, yes, they still exist and they still get delivered. But is advertising in the Yellow Pages worth the money for a small law firm? The short and simple answer is no, you can’t get a Yellow Pages ad to pay for itself. Let’s examine the Yellow Pages to illustrate my point. The value of an advertisement to your law firm is directly related to the number of paying clients it generates. Clients, not leads, make you money. 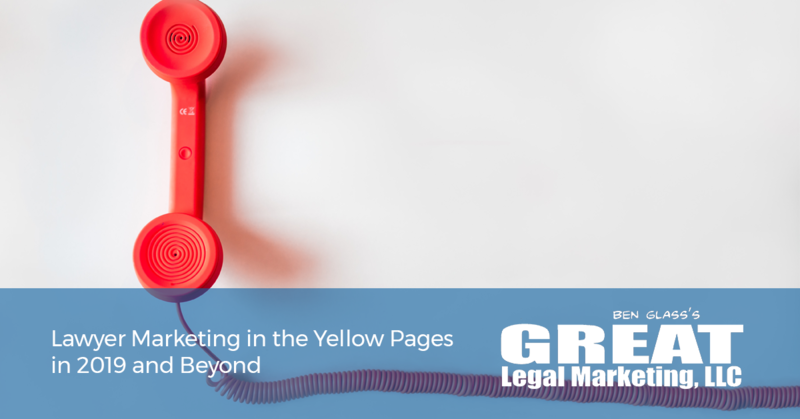 If you got a thousand leads from the Yellow Pages but only one client, you wouldn’t be happy. Whereas, if you got 18 leads and six clients you would probably be happy. The return on investment largely depends on the value of a client to you, and how much you spent on placing the advertisement itself. If spent 45k placing a big ol’ color front page ad on the YP booklet they throw on doorsteps each year, but you got two clients each worth 39k, you’d happily rerun that ad. If you got 6 clients each being worth 5k you’d be far from thrilled. What’s scary is that most small law firms aren’t even tracking where their clients are coming from (again clients not leads), or how much those clients are worth to them. 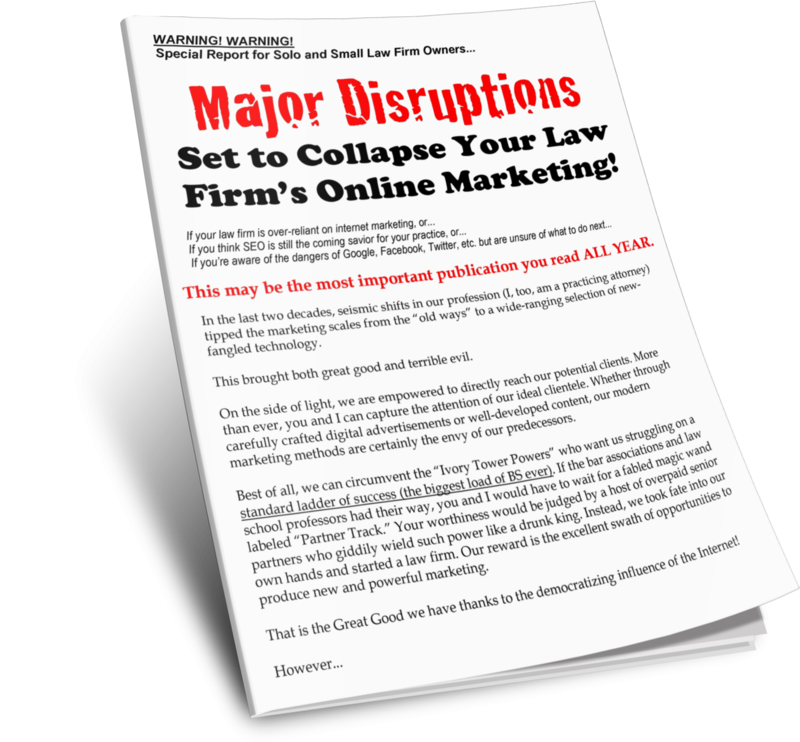 Many law firms wouldn’t be able to run a basic ROI calculation on their marketing campaigns. The good news, and this is unique information to the Yellow Pages, is that you have an alternative way to examine the effectiveness of the Yellow Pages that’s relatively effective and super simple. This method isn’t quite as good as an ROI calculation, which is the preferred method, but it will get the job done. The method is called the “Have you ever opened the Yellow Pages for any reason” method. It’s not even a joke. Have you or someone you know used the Yellow Pages for anything in the past 7 years? I’ve thrown them away. I’ve made successful attempts to tear them down the spine, which is becoming easier because they get smaller every year. I’ve opened one to write an article on how ineffective they are. But I’ve never used a Yellow Pages book to find a business to spend my money at. People are more liable to use them as scrap paper to write down the results of a Google search than they are to find a restaurant much less an attorney in. The only thing people read, if anything, on a YP book is the front page as they walk it over to the trash. Unless the reader just got a DUI 25 minutes ago and assuming you spent less than 3k on the front page (front page in YP can easily run tens of thousands of dollars) then it's not worth consideration. Does the sluggish death of the Yellow Pages mean print is dead? Absolutely not. In fact, if you’re thinking about doing print advertisements, you are already thinking differently than a huge percentage small law firms. Thinking differently and going against the grain is a sign that you’re on the right path. You can squeeze huge ROIs from direct mail and print ads because most of the marketing dollars are being spent on the almighty Internet (dollars often very poorly spent). Unlocking the code to writing persuasive eye catching advertisements that generate a response from qualified leads is one of best ways to get a line of future clients knocking down your door to hire you over anyone else and with little regard for price… but that’s a story for another time. Suffice to say, don’t pay for YP ads in their physical book or on any of their online listing service garbage, unless you’re regularly measuring and demonstrating an ROI on your existing ad. There are too many places and too ways to make your dollar work harder and more constantly than the dying, dying, dead Yellow Pages. Joe Mann is a former insurance claims adjuster turned Partner Manager at Great Legal Marketing.